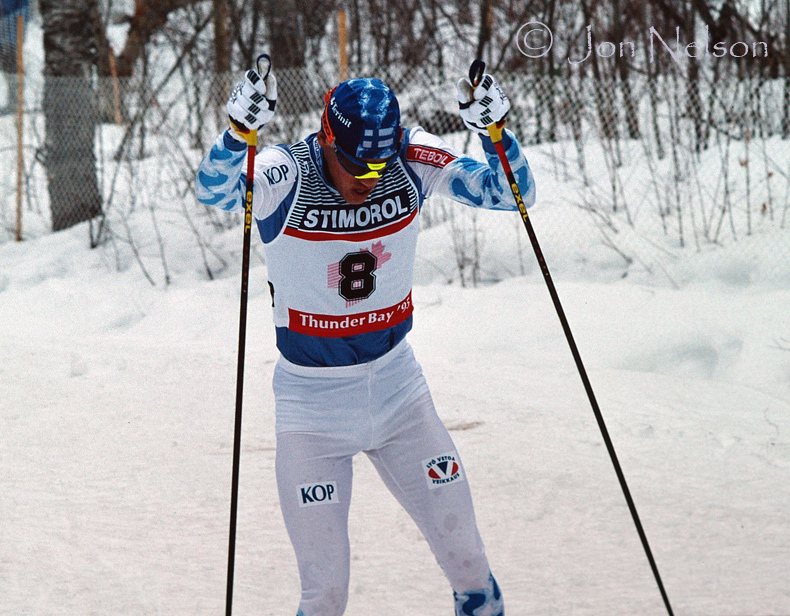 Posted December 30, 2011 in Cross Country Skiing Photography. 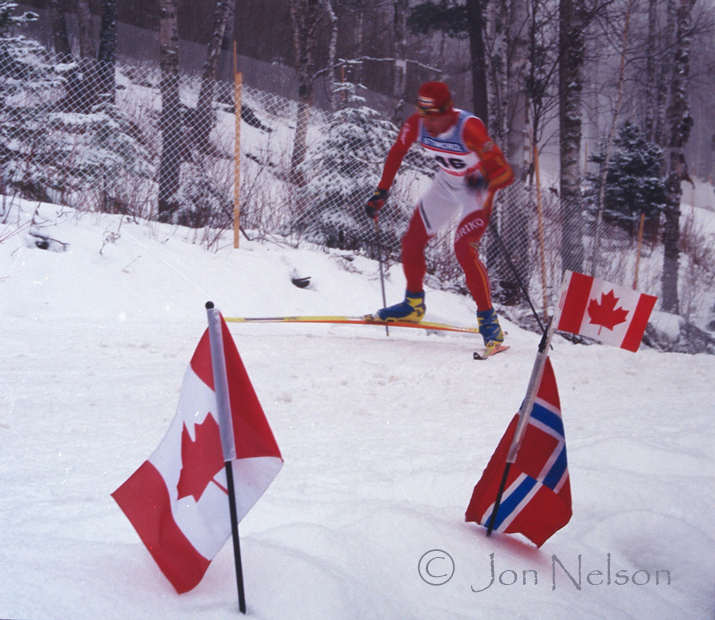 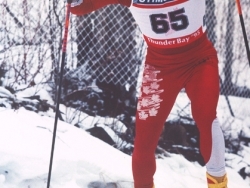 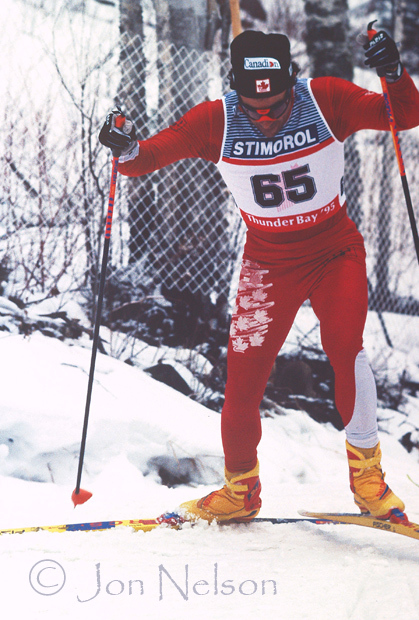 In 1995, the World Nordic Games were held in Thunder Bay, Ontario. 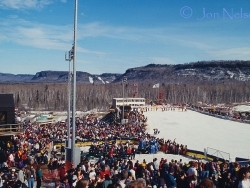 From March 9 to March 19, Big Thunder Sports Park in Thunder Bay was the host to the biggest event in cross country skiing, nordic games and ski jumping. 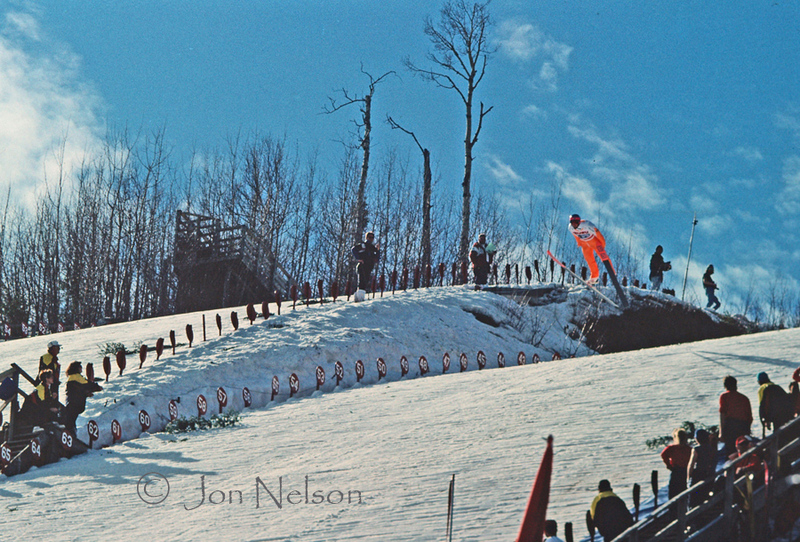 What an excellent facility this was – terrifiic trails and a wonderful place to watch skiers competing. 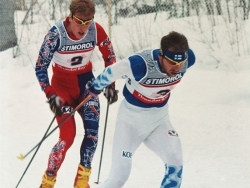 The 1995 Nordic Games was only the second time that the championships were held outside of Europe. 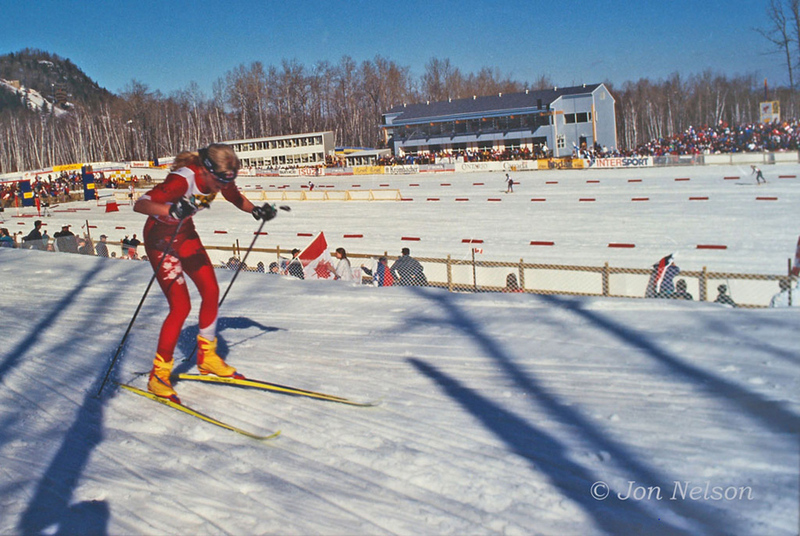 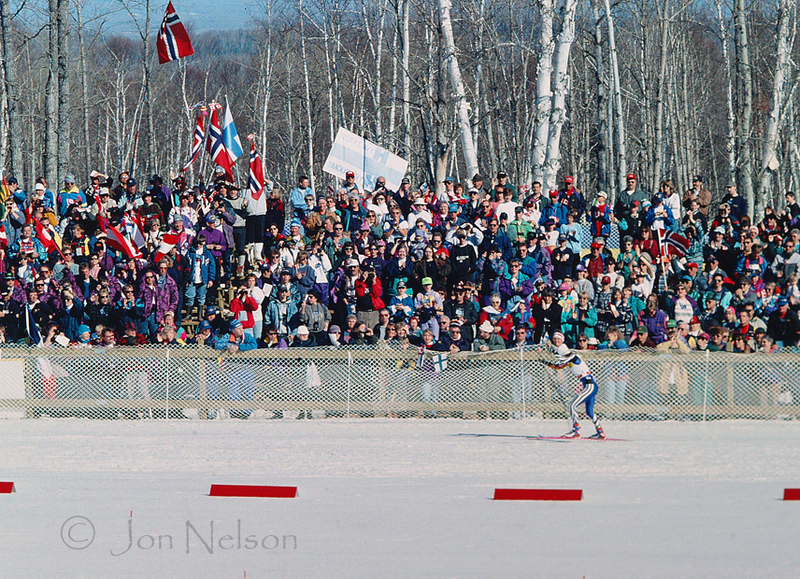 Lucy Steele, a Canadian skier from the Yukon, approaches the stadium at the 1995 World Nordic Games in Thunder, Bay, Ontario. 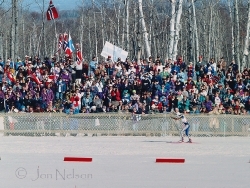 The crowds were loud and enthusiastic during the cross country races. 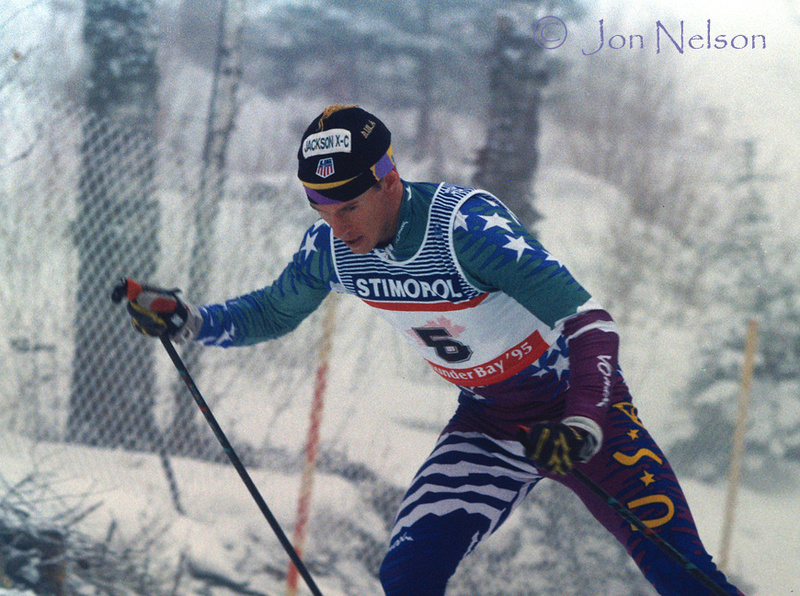 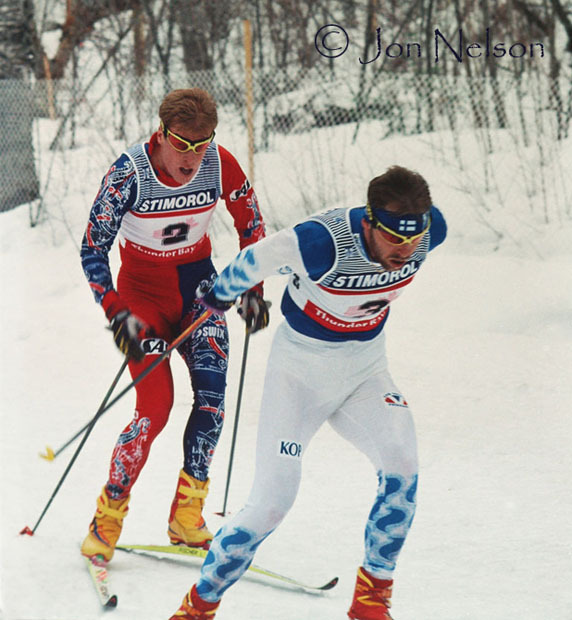 Bjorn Daehlie follows a Finnish Skier during a race at the 1995 World Nordic Games. 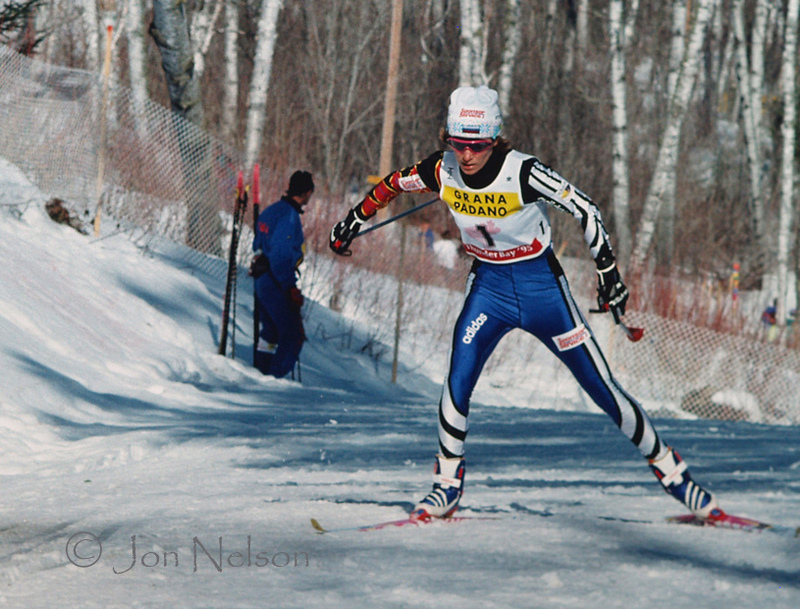 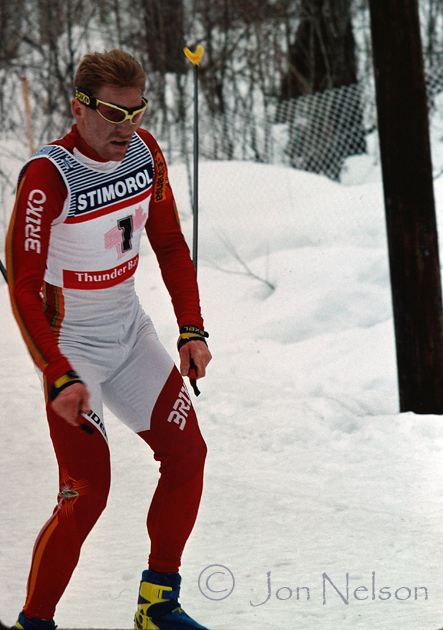 Yves Bilodeau competed for Canada in the 1988 and 1992 Olypic Games and here he is racing in the 50km skate race at Big Thunder. 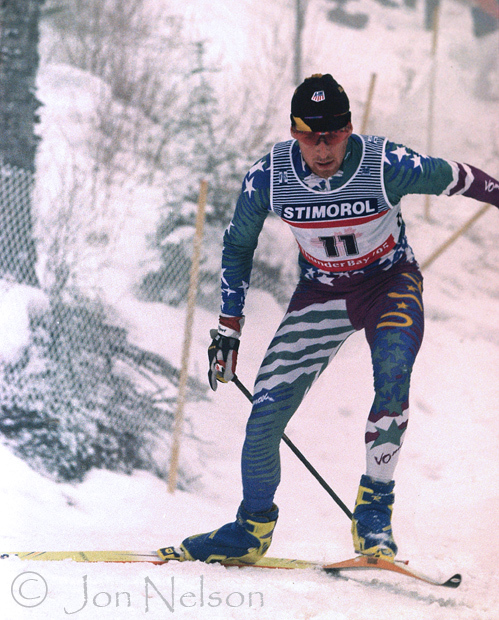 Carl Swenson, who competed for the United States in the 1994, 2002 and 2006 Olympics, races in the 50 km freestyle race at Big Thunder. 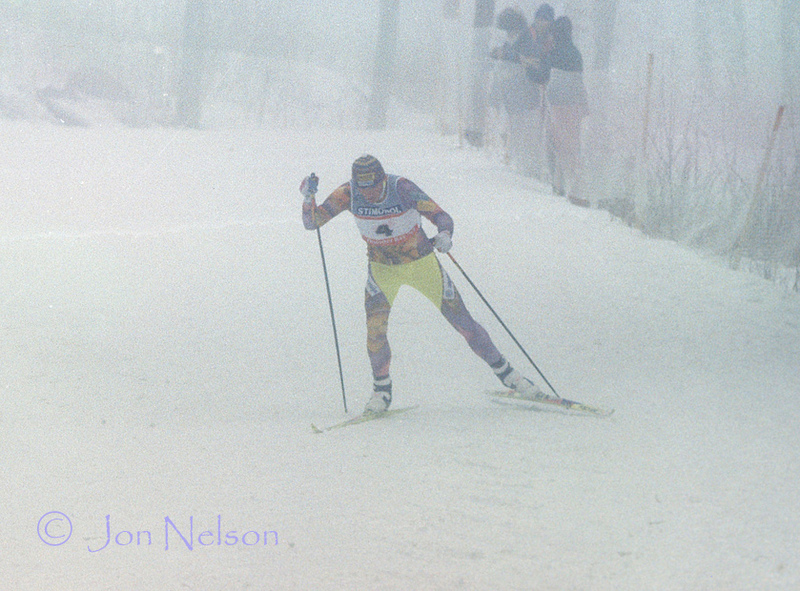 United States skier Marcus Nash nears the top of a hill during an early stage of the 50 km skate race. 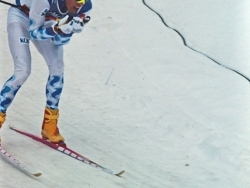 A Finnish skier gliding on the visibly dirty snow that appeared after the warm weather caused the snow pack to greatly diminish. A skier appears through the fog that enveloped Big Thunder during a skate race. 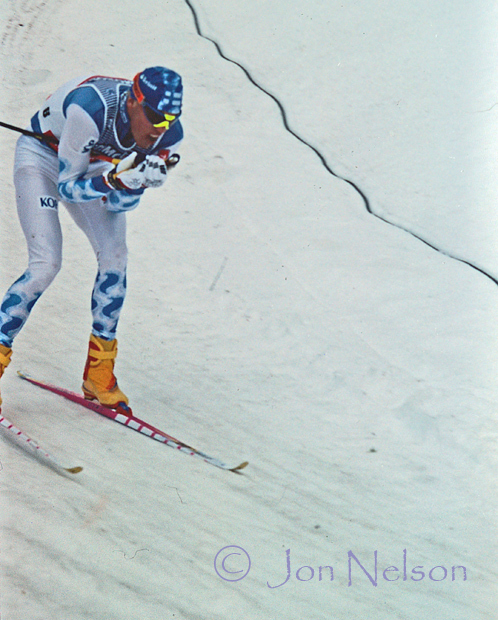 Jari Isometsa won a Bronze medal in the Pursuit race at the 1995 Nordic Games and was also part of the Finland team that won a Silver medal in the Men's Rely. 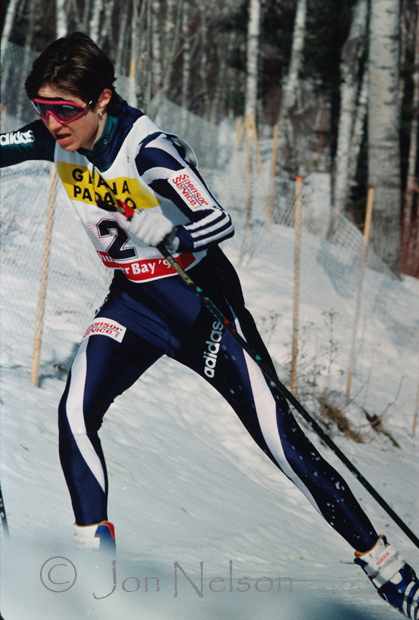 Manuela DiCenta competing at the 1995 World Nordic Games. 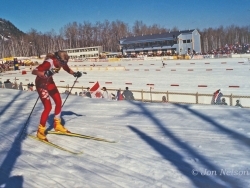 Female skier in the skate portion of the Pursuit race. 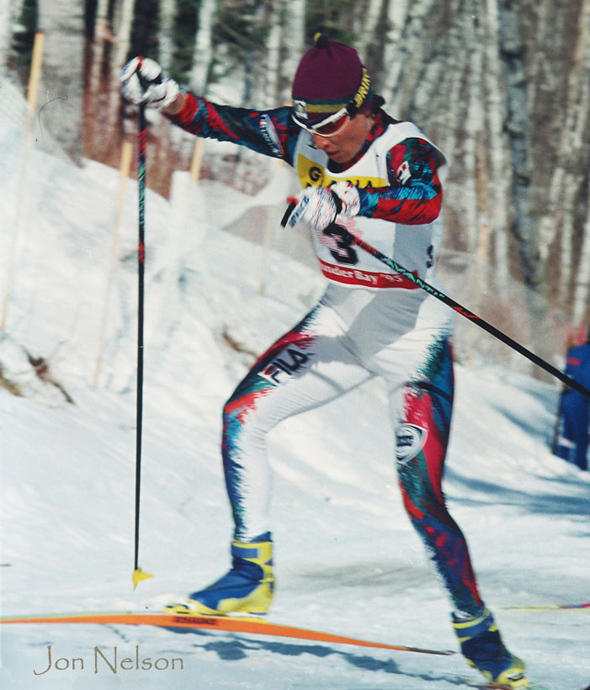 Larissa Lazutina won three individual Gold medals and was also a member of the Russian Women's Relay team that also won a Gold medal. 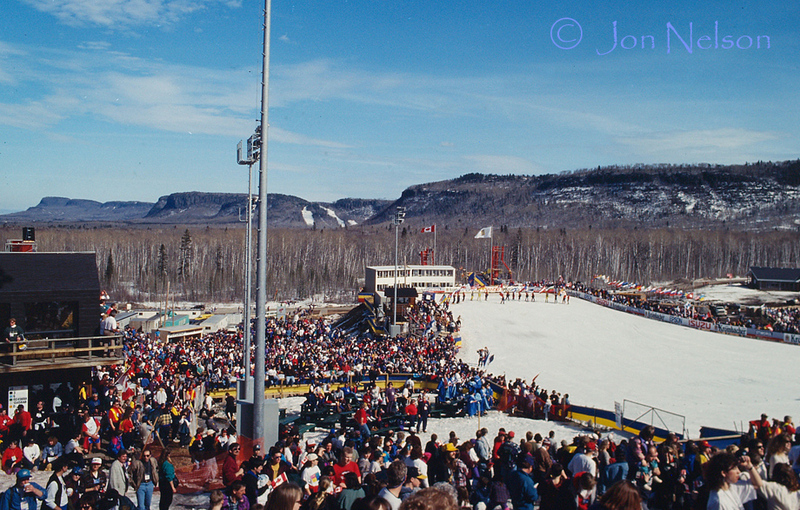 The crowds, like those at the bottom of ski jump hill, were large throughout the ten day event. 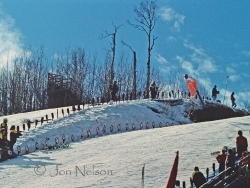 A ski jumper approaches a landing during the ski jumping competitions at Big Thunder. 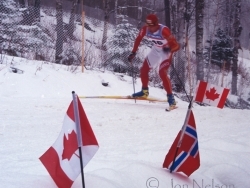 Vladimir Smirnov skies rapidly past Canadian and Norwegian flags along the race course. 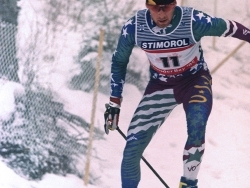 Vladimir Smirnov won three Gold medals at the 1995 Nordic Games. 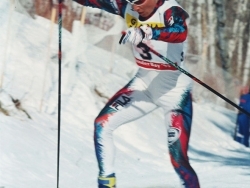 I am trying to find a list of the entries to the ski jumping events, primarily for the 1995 Nordic Championships, and if possible, for all the events at Big Thunder. 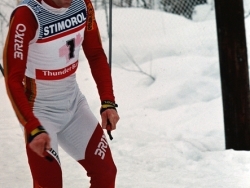 Anmy help in pointing me to the right source would be greatly appreciated.